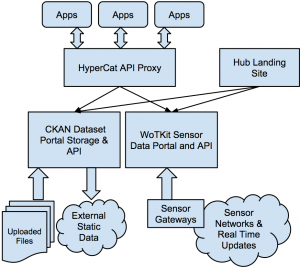 CKAN is a popular data repository used by many Open Data projects and widely used in a number of Smart Cities. Here in Canada, we use CKAN as part of the Urban Opus data hub. 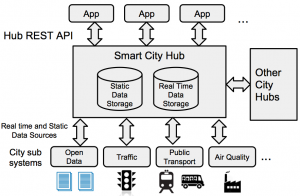 The Urban Opus Smart City hub has been running for over 2 years. 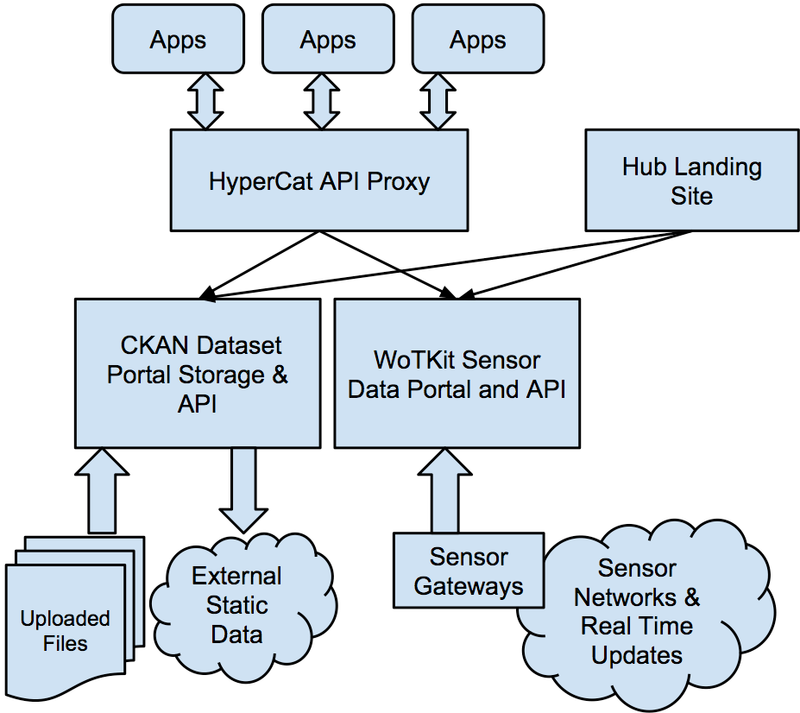 The details of its design can be found in the technical paper but it basically consists two core components, CKAN as a document repository and an IoT platform (WoTKit) used for time series data as shown below (right side). Typically – although not always – open data sets are static data, published infrequently and usually stored in a document store like CKAN’s FileStore. 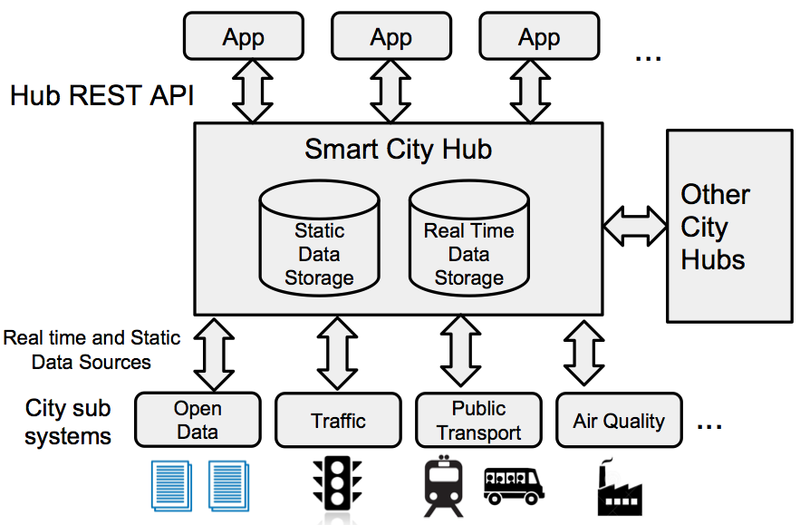 Real time city data, such as data from sensors, mobile phones, transportation etc, tends to be stored in a data base that is optimised for time series data. While we’ve been happy with this setup, there is a cost to maintaining and supporting our own bespoke CityHub and in particular, a full blown IoT platform. Recently we decided to investigate part of the CKAN platform that we haven’t used much – and which seems to be only lightly used by most use – the CKAN Datastore. While it’s clear that the datastore can be used to store and access fine grained data, such as individual 311 records, like most traditional databases it is not optimised for time series data, i.e. data that is arriving in quasi realtime and is constantly updated. For example the real-time location of a bus or the electricity usage of city hall. Our goal was to understand the performance of the CKAN datastore running on a small server machine and to see if we could we use it to replace our highly optimised IoT platform. To do that, we decided to run a series of performance tests using the CKAN datastore web API looking how it performed with a variety of client loads and against both small and large databases. For all tests, we used the same small server: Desktop server running Ubuntu 16.04, Intel Core i5, 8GB RAM, 10MB/s bandwidth. These tests were carried out by Nam Giang, a PhD candidate at the university of British Columbia (Dept of ECE). We acknowledge his hard work and useful insights. The first test performs a simple query to look for 10 records in the table corresponding to ten timestamped sensor readings. We increased the number of clients – all making simultaneous request – from 50 to 500 and looked at the average response time. 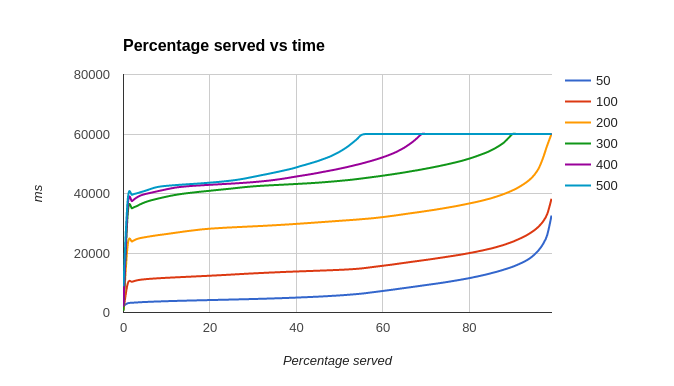 As can be seen in the graph below, on average, about 80% of the requests are performed within 10 seconds (10,000 milliseconds) but under high load, eg 3-500 simultaneous clients, some requests could take upto a minute. 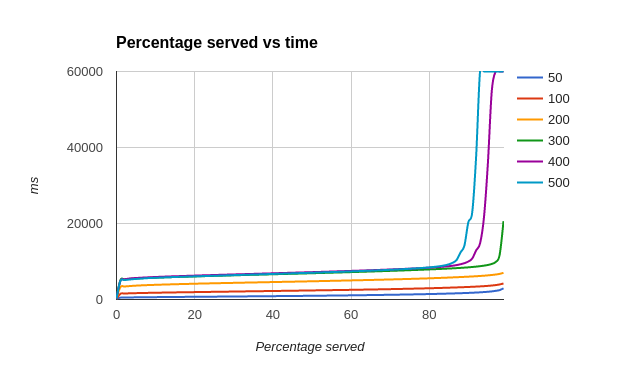 Looking at the overall server performance, we plot the requests handled per second under the different loads. Again, we can see an average of approximately 40 requests per second on our server. the server can handle about 42 requests per second. In the previous test, we were using a relatively small table (approx 140,000 rows) which is really only even for a day and a halfs data from a sensor sending data every second. A more reasonable table size would be a million rows. However this is a far larger table and is likely to have a performance effect. To understand that we ran the same tests but with the bigger table. Test 3: Comparing a variety of requests made to the CKAN server. 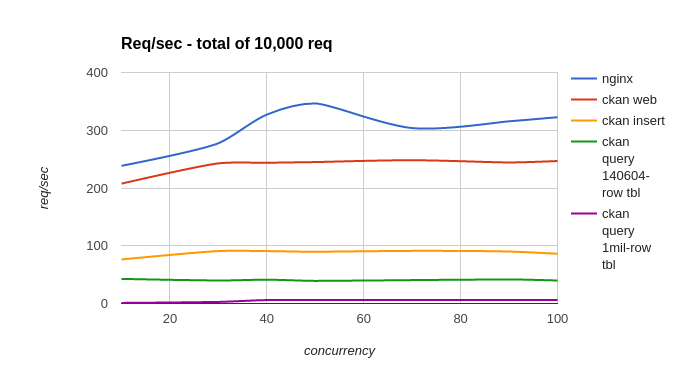 For our final test, we wanted to understand the performance of the DataStore when it has a variety of different requests. Remember in the tests above, all clients are reading data – which is probably not a realistic scenario. In this test we mix up the rquests and include inserts, web access and read requests. Generally, the server performs well with data write requests with about 100 requests per second capability. For data read requests, there is a significant degradation in performance with regard the size of the data table. Specifically, for a table of size 140,000 rows the server can handle about 40 requests per second. The performance plummets to about 10 requests per second for a table of size 1 million rows. 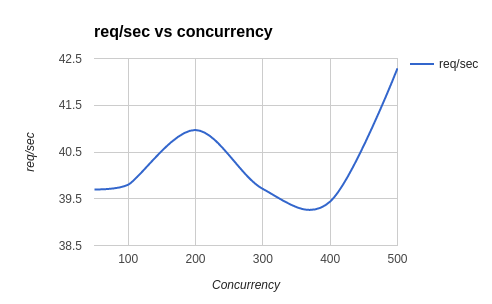 This performance is somewhat strange, read operations are generally quite lightweight and should be less costly than write (insert) however we can see from the above that read requests are very slow. Since the CKAN datastore is based on the PostgreSQL database, we were puzzled by these performance figures. They indicate that CKAN imposes an overhead, that at times is significant, and that traditional data read and write performance seems to be inverted. To understand this better we took a look at the CKAn datastore code to try and determine what it did with API calls before it actually called into the PostgreSQL database. What we found was that when the CKAN Datastore processes the requests made through the “datastore_search” API, it add a count(*) to the generated query to return the number of rows in the table. If we bypass this behaviour and use the native SQL API – “datastore_search_sql”, then it’s much faster because we provide our own query. 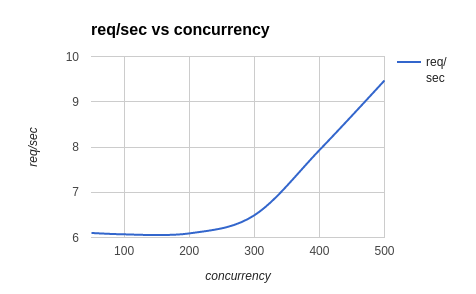 In general, a request falls from 400ms to approx 90ms – which is closer to the raw performance we expect from PostgreSQL. Our next step is to improve this performance to get closer to the raw SQL performance of PostgreSQL by optimising the CKAN datastore API. To do this, we plan to rewrite the code and offer it as new plug-in for CKAN.